Appreciating those who do life’s unpleasant jobs: A lesson in the virtue of generosity. My next door neighbor, Tim, is a school teacher, which means that from June to August he gets to forsake his usual hectic schedule for one that involves nothing more stressful than puttering in his garage and watering the flowers along his sidewalk. I can see his front yard from my office, and I’ve noticed a certain ritual he observes during his summer vacation: Every Tuesday, when I hear the roar of the garbage-collection truck coming down the street, I see Tim walk out into his driveway and wait. As the truck pulls up, Tim waves to the driver and gives him a big, beaming smile, then turns around and walks back into the house. Most people would probably consider a career as a trash truck driver to be the bottom rung on the ladder of humanity, but in reality, it is a noble and respectable profession. Imagine what our streets and homes would look (and smell) like if not for the trash truck drivers of the world. 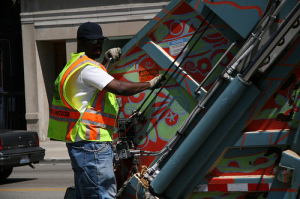 Everyone benefits from the service the garbage collector provides. Do you tuck a little something extra in with your trash bill when the holidays come around? I know I do — I’ve always thought it was an easy way to let the trash truck driver know that I am grateful for what he does. But maybe it is a little bit too “easy.” Maybe I’ve overlooked the value of a smile, a wave and a word of thanks. Gratitude is an important aspect of the knightly virtue of generosity. Tips, bonuses and other monetary rewards are wonderful, but they will never eclipse the need for personal, sincere, eye-to-eye expressions of appreciation and recognition. The people who perform the dirty, menial and distasteful jobs that keep our world clean, safe and functional need to hear someone say “thank you” from time to time. Of course, I’ll continue to give holiday bonuses and generous tips for exceptional service, just as we all should, but whenever I see Tim out in his driveway, I’ll remember that there’s more to generosity and chivalry than just a dollar sign. A knight in shining armor should always wave to the trash man.